Jake Guentzel weighs about 140 pounds. Soaking wet and after a hearty meal. Bobby Bruski? He goes 210, easy. More, probably, during the offseason. They make for an odd combination, these two Hill-Murray linemates. 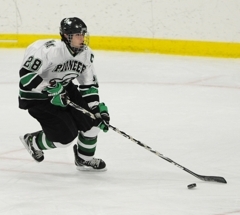 A linebacker during football season, Bruski has described himself as a “third-line grinder.” Which isn’t accurate at all, considering he was centering the Pioneers’ top line against the Cadets and scored twice in the second period. And if Bruski really was a grinder, he wouldn’t have known how to celebrate after scoring. 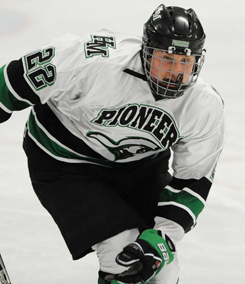 Instead, after each of his goals, he raced directly to the Pioneers’ student section and jumped squarely into the glass where a sign that said “push” and depicting a button was being smashed up against the rink. The height of euphoria for the Pioneers and their fans came late the third when Guentzel took a gorgeous feed from Ben Bahe, the third member of the line, and rifled a shot into the upper right corner of the net. St. Thomas Academy goaltender David Zevnick, a sophomore who had been spectacular all game, had no chance on the goal. Funny, that Guentzel would refer to Zednick as a young guy considering Guentzel himself also is just a sophomore. Not that he plays like one. “He’s calm collected, even in those situations,” Bruski said about his linemate. “He can see the ice well, he can see the net. And so Hill-Murray also wins the battle of state No. 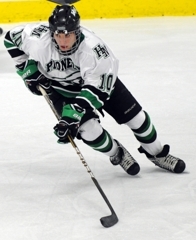 1s (Hill-Murray is ranked No. 1 in Class 2A; St. Thomas Academy No. 1 in Class 1A). It helps to have the sledgehammer/scalpel combination of Bruski and Guentzel. Pioneers coach Bill Lechner has juggled his lines for most of the season, but he keeps coming back to Bruski and Guentzel. 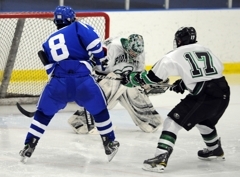 Click here for another story recapping Hill-Murray's dramatic victory. 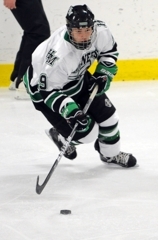 Sophomore Jake Guentzel scored with 1 minute, 13 seconds remaining to lift Hill-Murray past St. Thomas Academy 4-3 on Thursday, Jan. 27, at Aldrich Arena in a matchup of the state’s two No. 1-ranked teams. 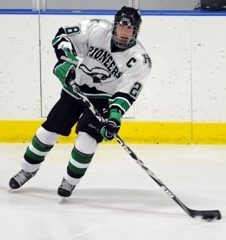 The Pioneers (13-3-1) entered the Classic Suburban Conference showdown as the newly anointed No. 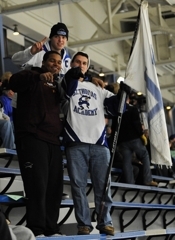 1 in Class 2A while St. Thomas Academy (10-5-0) had taken over the top spot in Class 1A from Hermantown. Senior forward A.J. 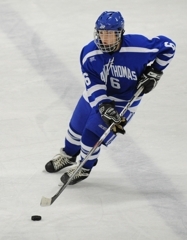 Reid scored twice in the third period for St. Thomas Academy as it rallied from a 3-1 deficit and applied heavy pressure in the Pioneers' zone throughout the final session. Reid almost scored again in the closing seconds as he banged away at a loose puck in the crease. After a scoreless first period, senior Bobby Bruski, centering Guentzel and Ben Bahe on Hill-Murray’s top line, scored twice. 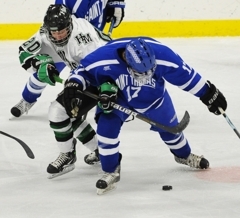 Hill-Murray’s Ryan Holler and St. Thomas Academy’s Peter Krieger also scored in the second period. Sophomore goaltender David Zevnick made 25 saves for the Cadets while Pioneers senior Tim Shaughnessy had 26 saves, including 13 in the final period. 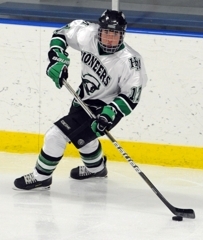 The senior forward, a standout linebacker in football and an intimidating presence on the ice sheet, continued to blossom as an offensive threat as he scored twice to bump his season goal total to nine. Speaking of goal scorers, here’s a natural born sniper. With the game tied and time running out in the third period, Guentzel calmly ripped a shot into the upper right corner to secure the win for the Pioneers. The sophomore goaltender showed the poise of a senior, especially in the early going as he stopped numerous Pioneers scoring chances. Zednick, who finished with 25 saves, couldn’t be faulted on any Hill-Murray goals, which came as the result of pretty passing plays in the slot.